Paid Survey Depot claims that you can earn your first $75 just by joining. But is Paid Survey Depot a scam or is it really a great paid survey site? I have joined to test it thoroughly myself. Let me reveal right away that I was NOT impressed with what I found. In this Paid Survey Depot review, I will share all the details with you so you can get an inside look and judge for yourself. 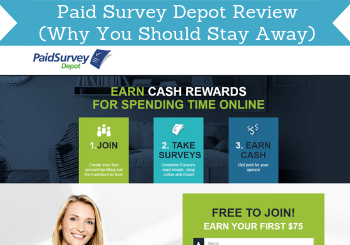 What is Paid Survey Depot and what does the site offer? When I first came to Paid Survey Depot, it right away looked familiar. It has more or less the same look like SaySo4Profit. This made me worried as I have previously tested and reviewed that site and it is, in my opinion, a big waste of time. I, however, decided to still test Paid Survey Depot and see if it offered the same or if it just looked the same. So let’s first look at what you are told you will get by joining the platform, and then after I will explain what really happens after you join. When you first come to Paid Survey Depot’s landing page, the steps you are told you need to take to earn looks like many other survey sites. 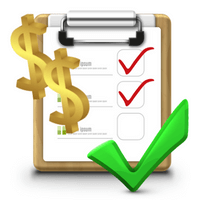 The supposed easy steps to start earning on Paid Survey Depot. You are shown you just have to join, you will then be able to take surveys and more, and finally, you will get paid. This is basically how most survey sites work. However, already on the landing page, there is, in my opinion, particularly one red flag you need to take into consideration before giving your email. Below the sign-up box, there is something written in small letters. Be aware of what you agree to when signing up. What it says is that by signing up, you agree to receive emails from PaidSurveyDepot and its partners. Usually, when you sign up for a platform, you will naturally start receiving emails from it. But what worries me here is that you will also agree to receive emails from its partners. You cannot click to see who these partners are and you have no idea how many partners they have. These means you actually do not know what you are saying yes to and how your contact info will be shared. This is a big red flag in my opinion and something you would not see on the top paying survey sites. I, however, still decided to give it a go and see what would happen after joining. This was also nothing like a regular survey site, as I will explain below. You just need to fill out your name and email to join Paid Survey Depot, so it does not take long to join. After you join, you do however not get directly to a members area as you usually do on paid survey sites. You instead get to a screen with several offers. What you get to after signing up. As you can see in the image above, there are 5 steps to go to finalize your registration. All 5 steps are just pages with offers from partners. Many of them are not offers that have anything to do with paid surveys. It is promotional offers Paid Survey Depot gets paid to promote. In my opinion, some of the offers are very poor and from the description of them, it is also hard to see what you can expect. Once you are then done with the 5 pages of promotional offers, you do however not even get to the members area. Instead, you just get directed to a list with paid survey sites that is on Paid Survey Depot. A part of the list you get directed to. The thing is that you did not even have to sign up to see this list. If you go to other pages on the website than the landing page, you will be able to see this list without having to join. So in fact, you are not joining a survey site as it might seem on the landing page. You are joining an email list so they and their partners now can send offers to you. Nothing wrong with signing up for an email list as it can be very helpful if you join good newsletters. But in my opinion, it should be clear what you are signing up to. I do not think it is clear on Paid Survey Depot that you are not getting access to actual paid surveys but just sign up for an email list. So it turned out that Paid Survey Depot is basically offering the same s SaySo4Profit that I also thought it looked like when I first came to the page. In addition to this, some of the survey sites you can find on the list are, in my opinion, and experience, just a big waste of time. 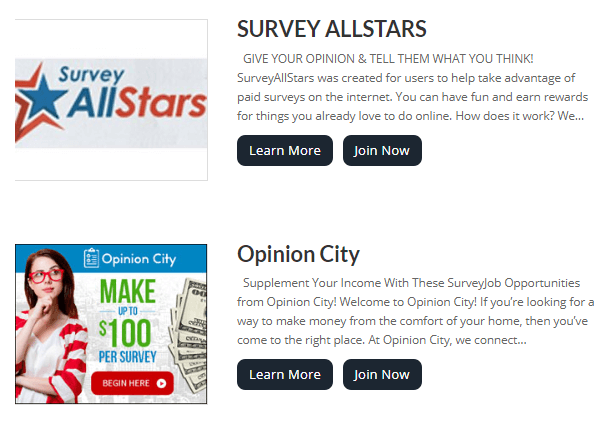 In the image above, you can, for example, see that one of the sites Paid Survey depot recommends is Survey AllStars. This is a site I have previously reviewed. Like Paid Survey Depot, it does also not give you access to any paid surveys, and it is also just a waste of time, in my opinion. Since you are never getting to an actual members area on Paid Survey Depot, there are also no paid surveys you can take on the site. This means that you cannot actually earn on the site. So even though it on the landing page might look like you can earn on the page, this is not actually true. From the landing page, it might look like you can earn on Paid Survey Depot – This is not the case. What it actually says on the landing page when you scroll down is that you will get access to a proven method to earn extra money online. This means that they will give you access to offers and promote option to you, but you will not actually be able to earn on the site. And in my opinion, it will also be very difficult to know which of the offers you get presented to will be worth it, as many of them definitely are not. So just to make it clear – you will NOT earn on Paid Survey Depot. If you are lucky, you will get some offers that can potentially make you a bit of money. But if you do not have any experience with paid surveys or making money online, it will be very difficult to spot which offers you could potentially benefit from and which ones you should stay away from. Just to make it completely clear – you cannot earn any money on Paid Survey Depot itself. This does however not mean you cannot make any money on paid surveys in general. If you join the best survey sites in your country, it can give you some nice extra cash. When it comes to online surveys, you do however have to be aware that it is not a way to make a living or become rich. If you are interested in making some nice extra cash and having your opinion heard, it is a great option. You just need to do it with the right expectations. According to the terms on Paid Survey Depot, it is only available for you if you live in the USA and are at least 18 years old. I assume this is because the platform is mainly promoting offers from the US and they can only get paid to promote it to people from the US. If you live in the US, there are however so many great American survey sites, so it does, in my opinion, not at all make sense to spend any time at all on Paid Survey Depot. In theory, you can actually join Paid Survey Depot no matter where you live. Survey sites that actually offer paid surveys usually have a strict control to make sure you only join if you are from the countries they allow. This does however not go for Paid Survey Depot as there is really no reason for them to ensure quality since you are not really becoming a member. So you can join no matter where you are form – but why would you? Paid Survey Depot is not a scam as it, as far as I am aware, does not do anything illegal. You do not pay to join, and you get access to some offers that can potentially help you make a bit of extra money online. But as you have probably already figured out from this review, it is still not a site I recommend. Let me sum up the pros and cons to give you a better overview so you can see why that is. Overall, I really do not see any reason to join Paid Survey Depot. It is, as I expected when I first saw it, the same setup and run by the same people that have SayS04Profit, which in my opinion is also a complete waste of time. You cannot actually earn on Paid Survey Depot, you have to agree to be contacted by their partners without knowing who they are, and some of the offers they promote are a waste of time. So really no reason to sign up for it in my opinion. There are so many great survey sites and you can check out a list of the best sites in your country for a start. All of these sites are sites where you can actually earn on the sites, and where you do not have to agree to be contacted by partners you do not know who are. So I highly recommend trying out some of these sites instead of Paid Survey Depot. If you have any comments, questions, or have any experiences with Paid Survey Depot yourself, I would love to hear from you in a comment below. Paid Survey Depot is, in my opinion, a complete waste of time. You never get access to a members area, it is not clear what you actually sign up for, you have to agree to be contacted by their partners, and you can not earn on the site itself. I do not see any reason at all to join this site, and it is NOT a site I recommend.